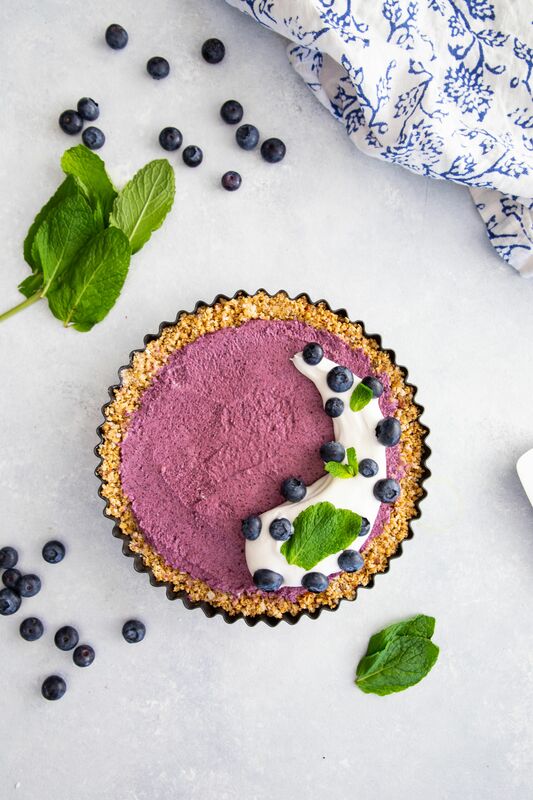 We used Cascadian Farm Organic Frozen Blueberries and Oats & Honey Granola to make this smoothie inspired breakfast tart! Cascadian Farm sure knows organic blueberries because they've been growing them since 1972, and they're still an integral part of the farm to this day! We can't wait to visit in September to see what else is in bloom! Click here to see how we made this breakfast tart! To see more recieps inspired by Cascadian Farm, click here! Spray an 8-inch tart pan with cooking spray and set aside. In the bowl of a food processor, add 2 cups granola, dates, nuts, dried coconut and coconut oil. Process until coarse crumbs form, about 2 minutes. The mixture should clump together when you pinch it between your fingers. Press the granola mixture into the prepared tart pan. Place in the freezer while you prepare the filling. Add the remaining granola, blueberries, yogurt, maple syrup, spices, salt, vanilla, coconut milk and lemon juice to a high-powered blender. Process until smooth. Add the blueberry filling to the prepared crust, then freeze until set, at least 6 hours, but preferably overnight.